Do you want to make a scarecrow for your local scarecrow festival? Or like to know how to build a garden scarecrow? Are you looking for creative scarecrow ideas? How about a design for a great scarecrow for the kids to make with you? Scarecrow making is a terrific craft project for the whole family to enjoy! You don't need to be a good artist or a good carpenter to make a wonderful scarecrow. You just need some imagination and be willing to have a go! 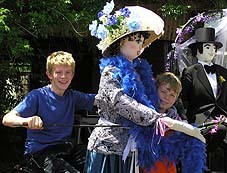 Alex and James Wagner with animated scarecrows, Nellie and Harold. Visit our constantly expanding Scarecrow Ideas section to see our scarecrow gallery with 20 different scarecrow display themes! Over 80 photographs and dozens more scarecrow ideas for you to make! A scarecrow ideas page built by MakeScarecrows.